The Hilinskis hope that in the long run, their son’s death will open a dialogue about the importance of mental health, and how colleges can best support their students in that regard, and eliminate any stigma around the subject. PULLMAN – The parents of Tyler Hilinski stood before the Washington State football team at the football facility on Thursday afternoon, looking around at their son’s distraught teammates. Hilinski, WSU’s sophomore quarterback, was known to all as a cheerful, easygoing and outgoing guy. He had a voracious appetite — among his favorites, pepperoni and bacon pizza and, chicken wings from South Fork — was always quick to crack a joke and was popular in the locker room. The 21-year-old came from a tight-knit family that just vacationed together in Cabo before the semester started at WSU. And Tyler had come back to school knowing that with Luke Falk gone, he was the mostly likely candidate to win the starting quarterback job once spring practice began. But everything changed Tuesday afternoon, when Tyler was found dead in his apartment from a self-inflicted gunshot wound to the head. Two days later, Tyler’s parents, Mark and Kym stood in front of his teammates at a meeting they had requested. They spoke to the team, then hugged every single player. And they did it because they want the healing to begin. Mark and Kym Hilinski declined to personally speak to The Seattle Times this week because they didn’t feel quite ready. However, they authorized the moms of several Cougars players to speak on their behalf. Ultimately, this is the message Kym Hilinski wants to deliver: “She doesn’t want Tyler’s death to be in vain,” said Jill Osur-Myers, the mother of WSU offensive lineman Noah Osur-Myers, and the co-founder of CougFam, the Cougar football family association that was started in 2015 to help connect the family members of WSU football players. That’s why Kym and Mark asked to speak to the team Thursday afternoon. “They care about our boys the way we care about Tyler,” Osur-Myers said. “They were worried about each and every one of these boys. And for them, the thought that any one of these boys (might think) they could have prevented this or seen it coming, when (the Hilinskis) couldn’t see it coming. That would have been a horrible thing for (the kids) to live with. And Kym said that. They have a great relationship with their son, and they didn’t see it. WSU coach Mike Leach said Saturday that Hilinski’s death came as a shock to everyone. “Tyler was always a very optimistic guy. Tyler was one of those guys who would always come bouncing into the room, and he’d make everybody happy. He brought an energy to rooms and groups of people and huddles,” Leach said. “Just talking to really everybody on this whole thing, there were no real signs. Everybody’s got some dark space they work through I’m sure. But nobody really saw anything like that. But first, healing has to take place. The police were not the first ones to find Tyler on Tuesday afternoon. Two WSU players did. Tyler had uncharacteristically missed lunch and a workout that day, and the team had started to worry. Two players happened to see his car parked outside his apartment and they found Tyler inside. WSU football staffers and the police were alerted, and someone arrived to drive the stunned players back to campus. At the football operations building, the players were met by the football athletic trainer as well as a grief counselor and psychologist. Led by Director of Athletic Medicine Dr. Sunday Henry, the Cougars’ athletic department also has a clinical psychologist and licensed counselor on staff. That day, they immediately mobilized to help student-athletes cope with an impossibly tough situation. “We mobilized as a team and developed a plan very quickly on how to tell the football team what had happened,” Henry said. Henry, the psychologist and the counselor were present when the team found out about Hilinski’s death. Since then, they’ve met with every sports team except men’s basketball, which was on a road trip. Henry says they’ve also tried to be proactive about reaching out to players who they think might need help instead of waiting for the kids to come to them. The Cougars’ athletic training staff has been particularly important in this process because the trainers that work with the individual teams know the players well and can identify when someone might be struggling. Nancy Swanger, the WSU faculty athletics representative, was in Indianapolis for the NCAA’s annual convention when she heard about Tyler’s death. On Thursday morning, when in a meeting with representatives from the Pac-12, Swanger addressed the group and talked about what had happened at WSU. That inspired a lively discussion about how schools can better support their student-athletes in the mental health sphere. It can be as simple as generating a best practices list of mental health resources for all schools to refer to, Swanger says, citing Stanford’s practice of pairing an advanced psychiatry grad student with each of its athletic teams as something WSU and other schools could potentially emulate. Another suggestion that came up: have each Pac-12 school reach out to any student-athletes who have battled mental health issues and are willing to talk about it, and film public service announcements that could be aired on the Pac-12 Network. The ideas generated at that meeting were collated and pitched directly to the Pac-12 conference office, Swanger said. Bottom line: “We’ve got to let people know it’s OK to get help, or ask for help,” Swanger said. In the long term, Hilinski’s death might spark advances in the way student-athletes talk about or deal with mental health issues, but in the short term, it has already triggered that discussion and brought the WSU community together. The moms of the WSU football players are a tight-knit group who’ve built close relationships after many weekends spent tailgating on the Palouse and cheering on their sons. Soon after they heard about Hilinski’s passing, many got in cars or on planes to come to Pullman to be there for their sons. Osur-Myers was one of the first mothers to arrive, in part because her son asked her to come be with him. Hilinski’s death marked the second time in two years that Noah had lost a friend to suicide, Osur-Myers said. Noah’s high school football teammate killed himself about a year and a half ago, and it took Noah a lot of time, and work with a psychologist to process his friend’s death. However, that experience, “enabled him to know what he needed this time,” said Osur-Myers, who also suggests that WSU could add a sports psychologist to its athletics support staff to help teach kids what she calls ‘life skills’ in dealing with subjects like loss, success and failure. Noah called his mother and said he needed her, and his brother, to come to Pullman to support him, and Osur-Myers flew in as early as she could, arriving in Pullman on Wednesday afternoon. Because of all that she went through with Noah when his high school teammate died, Osur-Myers stressed to the WSU football program that the counselors needed to check in with the players. Over the next couple of days, other Coug parents and former players trickled in steadily, all drawn to Pullman by a need to be together, and to support the Hilinskis in their time of need. Chrisi Dotson drove over on Wednesday from Seattle with her son, Isaac. So did Kim Pelluer, the mother of Peyton, and Julie and Rob DeRider, Nate’s parents. Analee Falk, Luke’s mother, flew in from Utah, Mary Ann Begg and Tracy Cracraft came in from southern California. The Singletons, the Markoffs and the Sweets also made their way to the Palouse. And Marianne and Mark Madison — Cole’s parents — arrived on Friday evening just in time for the candlelight vigil. The parents worked with the WSU coaching staff to ensure that the players were getting all the support they needed. Though, in some respects, the players had already taken matters into their own hands. Linebacker Peyton Pelluer, who missed most of last season with a broken foot and is waiting to hear whether the NCAA has approved his petition for a sixth year of eligibility, took charge. He was the coaches’ conduit to the players, advising them on how the team was feeling and whether they felt up to the idea of workouts. He helped to ensure that everyone kept in close touch, even guys like Tyler’s former roommate, C.J. Dimry, who exhausted his eligibility in December, but is still in Pullman. 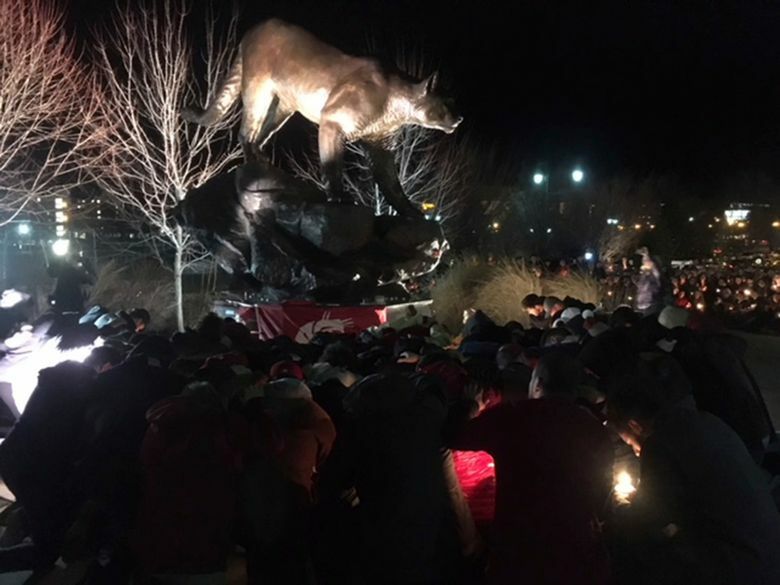 Being together at the vigil, and then later, at a private CougFam-organized memorial for Tyler, was cathartic for everyone, the moms say, and it gave the team a safe space to express their emotions. At the CougFam memorial Friday night, players and coaches took turns standing up and sharing stories about Tyler with the Hilinskis, who were seated in the front row. “There was not one of those boys in that room who didn’t shed a tear,” said Mary Ann Begg. Leach says the coaches will slowly start re-introducing team activities because “the counselors have advised that resuming activities is healthy for them.” But, Leach also said that anyone who needs more time away is welcome to take it. WSU will also provide transportation to any players and coaches who want to attend the Hilinski family’s memorial service for Tyler next Saturday in Laverne, Calif., Leach said. As Leach acknowledged, and as the moms cautioned, the recovery process will be a long one. CougFam has started a GoFundMe drive to help raise money for the Hilinski family. More details, here. The Hilinski family will hold a memorial service for Tyler at 1:30 p.m. on Saturday, Jan. 27, at Damien High School in La Verne, Calif. (2280 Damien Ave, La Verne, CA 91750). It is open to the public.